Anyway, I wanted to get something posted here so our legion of fans back in Seattle (if you’re reading this, you’re part of that legion) will know we have arrived and are well. We are well, albeit tired. The travel day was remarkably uneventful. And since arriving at the Boudeaus, we’ve been in the pool and Melinda has rented a car. 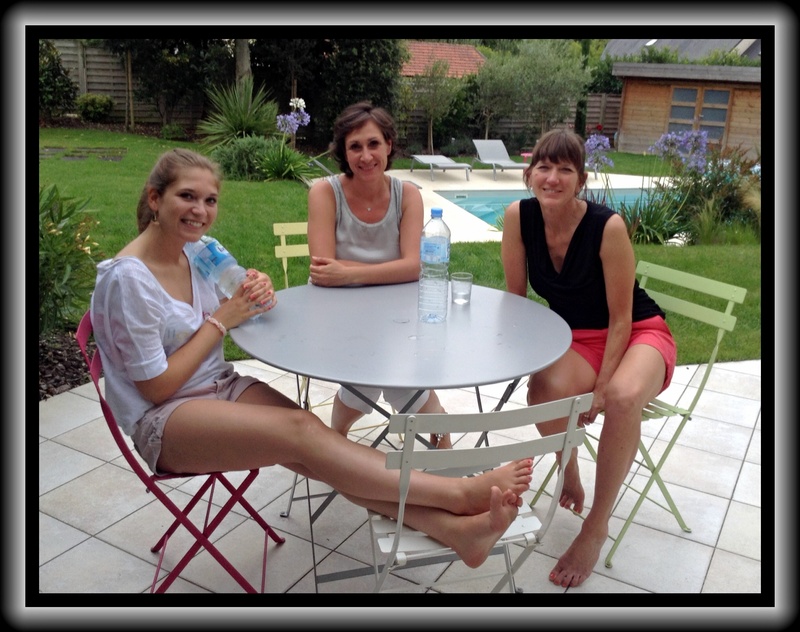 Right now, as illustrated by this photo, Melinda is chatting with Frédérique and Manon. Ella and Chloe* are at the Bertails, where we will soon all rendez-vous (that’s French, btw) once Laurent gets home from work. What’s that? It’s Laurent! Time to greet my friend! *Chloe in this case does not refer to Melinda’s and my daughter, but to Ella’s friend, who just so happens to be named Chloe and who is with us this summer. « 24 March, 2014 – Spring Break Happy Hour!